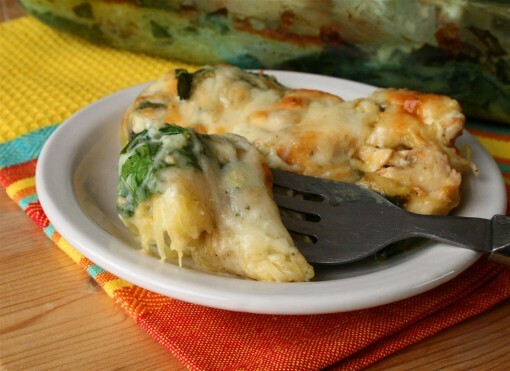 Low Carb Alfredo Bake was posted on April 14th, 2014 and is filed under Gluten Free, Low Carb, Main Dishes, Protein, Recipes. This entry has 1 comment. You can follow any responses through the RSS 2.0 Comment Feed. The secret to indulging my “I want pasta” mood…is the most honoured spaghetti squash. It’s the most magical vegetable in my universe. It also needs to be smothered in cheese. Because. And no, I don’t need a real reason. Cheese doesn’t need a reason. Ever. So I just tried this new Kraft Shredded Cheese with a Touch of Philadelphia…it’s amazing because they added a touch of the ever-so dreamy Philadelphia cream cheese to it. The result is the creamiest cheese I’ve ever had. Seriously. In short…I didn’t just buy one package. It was too yummy…the melt is all that I remembered. Gaaaah, so heavenly. And yes, I’m obsessive about cheese. No judgement allowed here! Kraft just came out with 3 delicious flavours – My favourite was the Creamy Heard & Garlic, but I loved the Creamy Mexicana too. The one I haven’t tried is the Creamy Mozza! I really liked that it comes already grated. Maybe I’m lazy but I don’t like cheese grating. So anyway, because I’m into eating lots of vegetables and eating low carb (low sugar), I decided to try something really decadent while being all full of veggies. Let’s just say I was successful! I shared this Alfredo Bake with a friend for lunch the other day and it was a hit…although I was sad to see a 6 serving recipe literally leave my fridge in like…two meals. Yes, I had seconds. 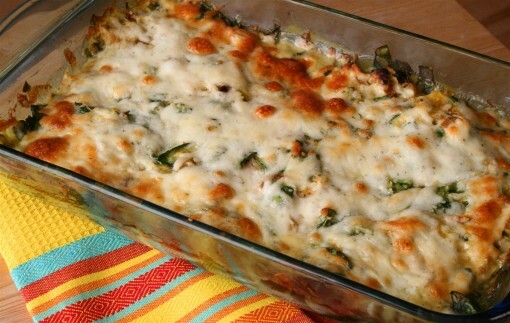 Mix all ingredients together in a large bowl and place in a greased 7×11 baking pan. Bake at 350 degrees for 45 minutes or until cooked well. Makes 6 servings. Note: I cook my spaghetti squash by cutting them in half, scooping out the seeds, and adding a drizzle of olive oil inside each side of the squash. I then bake them at 375 degrees for 15 minutes. Then flip and bake the squash upside down for 30 more minutes in the oven. Done. You can visit the Kraft Canada website to see more yummy and scrumptious recipe ideas that include Kraft Shredded Cheese with a Touch of Philadelphia and the Melt you won’t forget. Then let me know what you think of this creamy, melty cheese! You will probably be as obsessed about it as I am. Also you might want to know that Kraft Canada is hosting the What’s Cooking Twitter Party and you’re invited! It’s on Wednesday, April 16 at 9:00pm – just follow @KraftCanada and search for #TouchofPhillyCheese. Have you tried the new Kraft Shredded Cheese with a Touch of Philadelphia? Ever baked with spaghetti squash? oh. my. gosh. this looks SO delicious!